Okay, we don’t want to offend any carrot cake purists out there, but our new spin on the classic is pretty delicious, so be sure to give it a chance! 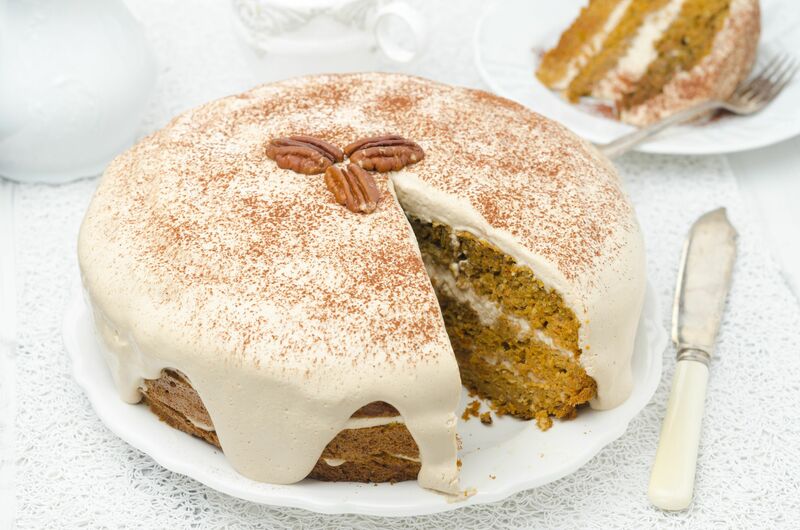 We included all the traditional elements, but also added a little pumpkin to the mix to really up the flavor and make things doubly special…pumpkin is a pretty subtle flavor by itself, but the addition of cinnamon, nutmeg and allspice really rounded things out and tied everything together. 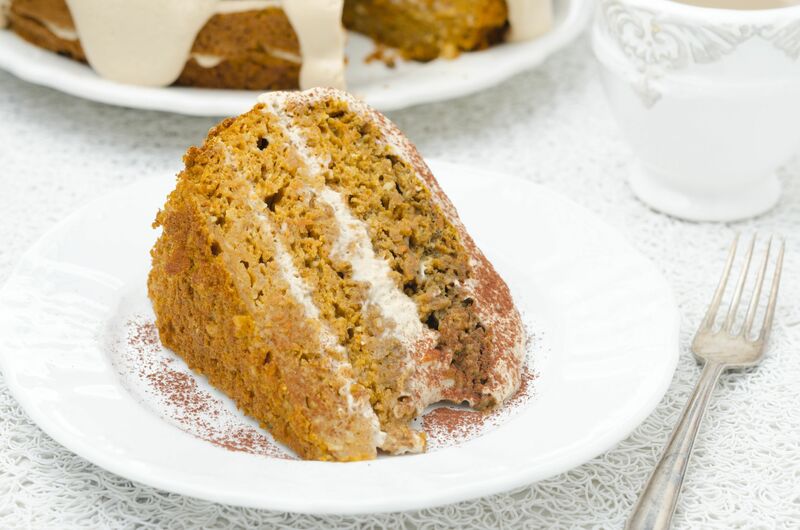 While we might not forever switch to pumpkin carrot cake, it’s definitely our top choice for autumn and we can’t wait to make it again! Preheat oven to 350º F and line two 8-inch cake pans (or three, depending on how thick you want your cakes) with parchment paper. Combine flour, baking soda, cinnamon, baking powder, nutmeg, allspice and salt in a medium bowl and whisk together. In a separate bowl or mixer, beat together eggs, sugars, vegetable oil, pumpkin puree and vanilla extract until combined. Fold in grated carrots and chopped walnuts, then evenly divide batter between cake pans. Place cake pans in oven and bake for 55-60 minutes, or until cakes are browned and toothpick inserted in center comes out clean. Remove cakes from oven and let cool 20 minutes before turning out on a wire rack to finish cooling. To make the frosting: beat together cream cheese and butter until smooth, then gradually add in powdered sugar until desired consistency and sweetness is reached. Note: add 1-2 tablespoons water to make frosting more of a thick glaze. Mix in vanilla extract and lemon juice, then, once cakes have cooled completely, frost (and stack) cakes. Garnish with cinnamon and pecans or walnuts, serve and enjoy!